Today’s Veterinary Practice “How I Treat” column is based on the popular How I Treat sessions presented at the annual NAVC Conference in Orlando, Florida (navc.com/conference). This column features interviews with leading veterinary specialists on pertinent clinical topics, with the goal of bringing practitioners essential information on therapeutic approaches. In this How I Treat column, Annette Smith, DVM, MS, DACVIM, answers our questions on diagnosing and treating mammary carcinoma in dogs. Q. What is the estimated incidence of mammary carcinoma in dogs, and what risk factors are associated with its development? 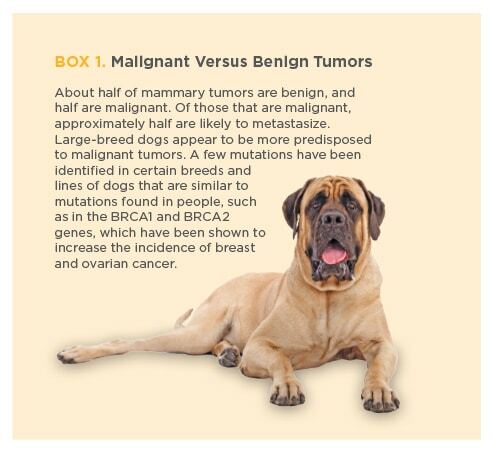 A. Mammary tumors are the most common tumor in intact female dogs, occurring in approximately 25% of this population, with the risk increasing with age. However, because of the incidence of early neutering in the United States, we see fewer cases in veterinary practice. Spaying before the first estrus cycle has been reported to decrease the incidence to approximately 0.5%, and spaying before the second estrus cycle remains protective, with an incidence of approximately 8%. Besides hormonal exposure, obesity at the time of puberty and ingestion of red meat and homemade diets have also been reported to be risk factors for mammary cancer development. Q. What diagnostic plan should you follow to get a definitive and staged answer? A. Mammary tumors require pathology after tumor removal for a definitive diagnosis, although we usually attempt to rule out other tumor types with fine-needle aspiration and cytology before surgery. These tumors can spread to local lymph nodes and the lungs, so sampling of local lymph nodes, if palpable, and chest radiography and abdominal ultrasonography are recommended. Computed tomography (CT) can be used to detect smaller lesions in the lungs, but its role in routine staging for mammary cancer has not been determined. The increased expense of CT and requirement for anesthesia may not be cost effective for most patients. Q. What is the current recommended treatment and its prognosis for dogs with mammary carcinoma? A. Surgery is the mainstay of treatment for dogs with mammary carcinoma, with the extent of surgery dependent on the extent of disease. The goal is to remove all existing masses, along with any local, easily accessible lymph nodes. Multifocal disease is common, occurring in more than half of patients. The role of ovariohysterectomy is somewhat controversial, but many oncologists recommend spaying at the time of tumor removal to remove any hormonal influence on tumor progression, as well as to eliminate the risk of ovarian and uterine diseases, which are also common in older dogs. Radiation therapy has not found a role in the management of canine mammary carcinoma, although it is a frequent treatment modality in treating breast cancer in people. Chemotherapy has also not been proven to extend survival in veterinary patients in most studies, but it is used frequently in dogs with tumors that have the potential to be aggressive. Doxorubicin, carboplatin, 5-fluorouracil/cyclophosphamide, and toceranib phosphate are some of the more commonly recommended chemotherapeutics. Hormonal modulation therapy (eg, tamoxifen) is not currently recommended in veterinary patients. Prognosis is most influenced by tumor type, size, and evidence of metastatic disease (Box 1). Lower-stage disease (<3 cm, no lymphatic invasion or distant metastasis) and well-differentiated tumors are usually associated with survival times measured in years after complete tumor removal. Mammary tumors are the most common tumor in intact female dogs, occurring in approximately 25% of this population, with the risk increasing with age. Q. How would a genetic blood test change the diagnosis and treatment for this disease? A. MicroRNAs (miRs) are small, noncoding RNA molecules that can be detected in the blood of cancer patients. If we can identify which miRs are specifically associated with the presence of mammary carcinomas, we may be able to make a diagnosis on the basis of a simple blood test, possibly very early in the course of disease. If we can identify markers associated with more aggressive types and perhaps predict response to treatment, it will inform veterinarians’ decision-making about how to manage these patients. I am grateful that the American College of Veterinary Internal Medicine Foundation has funded work in this exciting area and to be part of it! We are continuing to collect samples to investigate the utility of this approach in dogs with mammary carcinoma. 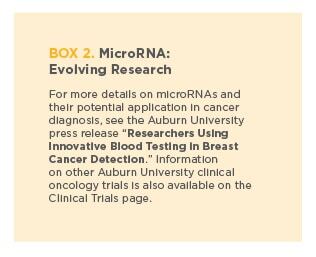 More information is available on the Auburn University website (Box 2). Annette Smith, DVM, MS, DACVIM, graduated with honors from Texas A&M’s College of Veterinary Medicine. After her internship at the University of Illinois, she joined Auburn University’s residency program, where she became certified in both small animal internal medicine and oncology and completed a master’s degree in biomedical sciences. She has served on the Auburn University faculty since 1999 and is currently the Robert & Charlotte Lowder Distinguished Professor in Oncology. She coordinates Auburn University’s oncology program, which focuses on a multidisciplinary team approach to each patient.